« If Your Kids Are Reading This Book on April Fools’ Day, WATCH OUT! Spring is here and I couldn't be happier! Spring is one of my favorite seasons because it is literally bursting with life. Everywhere you turn, trees are sprouting new leaves, flowers are blooming and the grass is becoming lush and green again. Baby animals are also being born and the birds are chirping happily in the sky. This is a great season to get outdoors and encourage your child to explore all of the wonder and magic that Spring has to offer. Thankfully, Learning Resources has just the solution to help your child learn more about how plants live and grow with the Primary Science Plant & Grow Set. I reviewed the Primary Science Plant & Grow Set from Learning Resources which retails for $29.99. The adventure in horticulture begins with the included activity cards. These are double-sided, fully illustrated cards which depict 10 different experiments to perform. Your child is encouraged to use their tools along with their five senses to explore and observe the basics of plant life. They'll learn more about what plants need to sprout, grow and mature as well as discover more about the natural world around them. What a great way to usher in the Spring season! Some of the activities included in the Primary Science Plant & Grow Set will take a few days to complete, while others might take a few weeks. The great thing is that these activities were designed to be performed simultaneously so you won't have to worry about running out of materials and needing to wait a long time to see nature in action. What's more, this set will teach children another important lesson about plants in general. Not all seeds are expected to germinate, which is why plants make so many in the first place. If you little scientist isn't having a successful growing experience with their particular seeds, then they should try again. Trial and error is a fundamental activity in every branch of science and I love how this concept is built right in to the Plant & Grow Set. 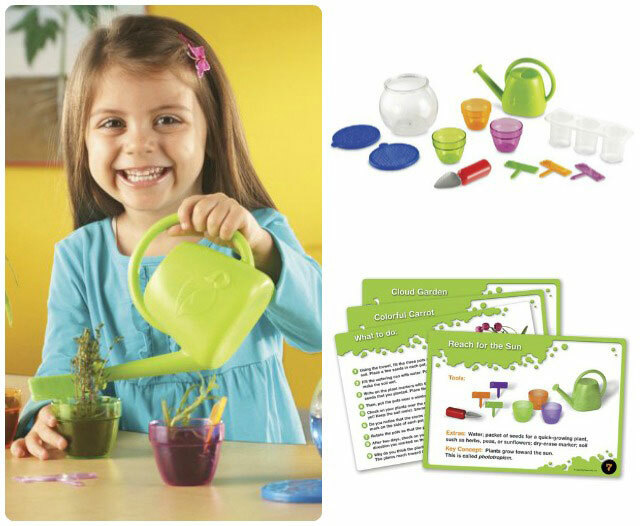 If you'd like to introduce your child to the wonders of Mother Nature this season, then be sure to open their eyes and their minds with the Learning Resources Primary Science Plant & Grow Set! Disclosure: I received the Primary Science Plant & Grow Set from Learning Resources in order to facilitate my review. No other compensation was received. This product review is based on my own personal experiences with this item and is completely honest and objective. Smart Splash® Letter Link Crabs would be fun! The Primary Science Hands-on Discovery Lab is great. A pretty great tool for a great activity for the spring break! My children would learn more because of this. I also really like the Hydroponic Lab. I love that you can see the entire plant, including roots, growing in the clear tubes. The gears gears gears super set! My son would love the GeoSafari Dino Digs- Tyrannosaurus Rex. Loved the website! I like this set Gears! Gears! Gears!® Lights & Action Building Set. Smart Splash Number Fun Ducks! My grandsons would LOVE the Primary Science Lab Set. I like the primary science jumbo magnifiers. the Primary Science Hands-on Discovery Lab would be great for the start a spring. The hands on discovery tank set. Science without getting messy! I love the Gears! Gears! Gears! Lights & Action Building Set. The magnetic butterfly life cycle. I love the learning gears. My little one would love the Gears! Gears! Gears! Super Set. I’d like the Primary Science Hands-on Discovery Lab. I would like the classifying animals cards, but the healthy playfoods look more fun. The New Sprouts™ Munch It! My very own play food would help us kick off spring! The Primary Science Hands-on Discovery Lab would be cool! The hands on Discovery Lab looks interesting. We could try our hand at Butterflies or Lady Bugs! We would love to have the Jumbo Endangered Animals set. I like the GeoSafari Dino Digs- Tyrannosaurus Rex. I like the Hydroponic Lab. Hydroponic Lab is the one I would chose. Always was an interesting way to grow things to me! The Dizzy Fun Land Set looks fun. Primary Science Hands-on Discovery Lab!!!! I really like the hydroponics lab.We are starting a hydroponic garden next week as part of our home schooling science lesson. Life Cycles Card Set would be great to learn about the changes animals go through. I like the Healthy Play Foods. 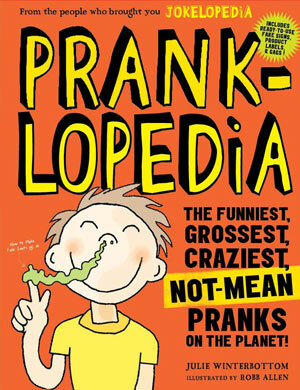 If Your Kids Are Reading This Book on April Fools’ Day, WATCH OUT!